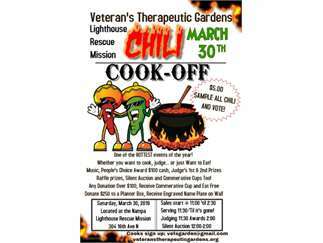 2nd Annual Chili Cook-off fundraiser for Veterans Therapeutic Gardens to help complete the Amphitheater in the "Serenity Garden" which will be used at a teaching garden at the Lighthouse Men's Shelter in Nampa. There will be music, commemorative cups, bouncy house for the kids, raffle prizes and a silent auction. Chili cook-off tasting and prizes for 1st place, 2nd place and "People's Choice" award.